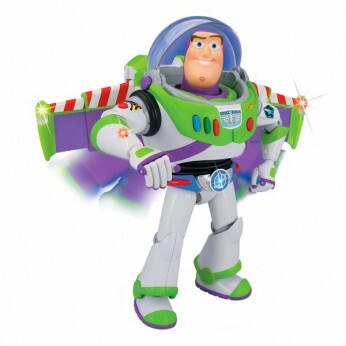 Buzz has over 60 phrases and 3 modes of play, Toy Buzz, Space Ranger Buzz and Talkback mode. Speak to Buzz and he will respond. Pop out his with light up wing tips or test his level sensor which knows when Buzz is in a flying position or standing! Interactive Utility Belt with light and sound effects. Batteries Required…. This toy costs approximately £44.99 (for the latest and best prices make sure you check our retailer list for the Toy Story Space Ranger Buzz Lightyear above). In our review of Toy Story Space Ranger Buzz Lightyear we classed it as being suitable for ages 3 years, 4 years, 5 years but recommend you check the manufacturer specific advice before purchasing.